My connection to journalism is that many of my family members wrote for papers or taught journalism. I am sort of a fringe person. I wrote stories for a monthly paper for the Montana Wildlife Federation. I don’t know who I am. I published a magazine, “The Portable Wall,” for perhaps 20 years. Out of my basement. 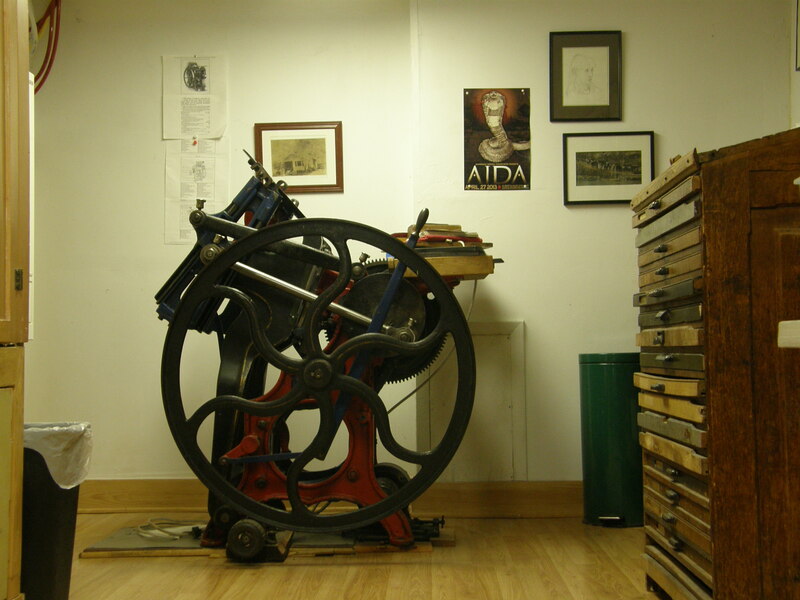 One of the presses is so heavy I don’t know how it will come out, but Nathaniel had one like it in his printshop. My father, also named Bob, sold a piece to a magazine, “Open Road for Boys.” That would have been 1918. At a homestead near Big Timber. According to him it ruined him for working at a real job. Oh yes. He tried teaching in White Sulphur Springs but he was unable to keep discipline. My mother said he nearly blew his stack. During college in the late 20s Bob wrote short stories and collected rejection slips. He eventually broke down and worked for the Bureau of Reclamation in north central Montana. Ultimately he married my mother. She put an end to his aspiration to be a Bohemian. Thanks to her charms I exist. My brothers have died, my sister lives in Nebraska. Bob and Helen moved to Great Falls to procreate. He edited the “Montana Farmer” and met secretly with Joe Howard and A.B. Guthrie and many unnamed others who made the Great Falls Tribune. They started the Montana Newspaper Guild in the 1940s. Bob organized the Guild’s social events. The Struckmans moved to Missoula in 1946 so Bob could teach magazine journalism. That’s when he made friends with journalists all over. Bob died of cancer in 1953. My mother taught grade school. She kept excellent discipline. My sister and I both edited school newspapers. I went to the J school in 1967 and became close friends with Dean Baker’s little sister, Virginia. I smoked too much marijuana and took too many pills and quit college. I rode freight trains, hitchhiked to Alaska, worked for the railroad. I was afraid of Vietnam most of all. I couldn’t leave it alone so I joined the marines. I joined the marines, got in trouble with the marines, stayed in the marines for seven years. I got out of the marines. By then I was married to Penny from Lewistown, with three kids. I picked up journalism again, unsuccessfully because I felt stupid. I was stupid. Oh, I finished my BA in Journalism but the reality of the newspaper business and my own foolish notions did not jibe. I found pharmacy an expedient career. I published my own magazine and got to know Wilbur Wood. Nathaniel always encouraged me. My sons both worked as reporters for Lee papers, both quit. One went to medical school, the other, Bob, got a job writing speeches for the president of the AFL-CIO, Richard Trumka. Now I am obsessed with writing about my lost maternal uncle. And sitting around. However, pharmacy called me to help at Omnicare so I have little time to do the goofing off I crave.